Despite the ongoing global and regional processes, Azerbaijan has successfully and rapidly developed, said President of Azerbaijan Ilham Aliyev at the meeting of the Cabinet of Ministers dedicated to the results of socioeconomic development of 2018 and objectives for the future. “2018 was a successful year for our country. Despite the ongoing global and regional processes, Azerbaijan has successfully and rapidly developed. All the tasks we set ourselves since the beginning of the last year have been fulfilled, and our country’s comprehensive and dynamic development has been ensured,” said President Aliyev. “Very unpleasant processes happened last year, and new risks, and threats are emerging in different parts of the world, including in our region. Conflicts and bloody clashes which broke out in previous years continue, stability in many places is violated, mass protests are widespread. Azerbaijan’s achievements show itself even more vividly against the background of this negative scene. Azerbaijan is a country of development, progress, and stability. 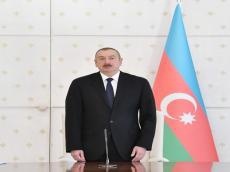 Regardless of the ongoing global and regional processes, Azerbaijan is successfully moving and will continue to move forward along its own path of independence and development,” the head of state said.